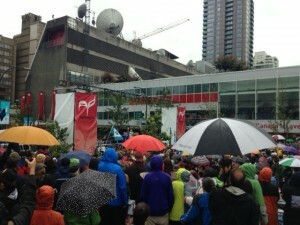 It poured and poured with rain, rains which were described as cleansing, unifying and the sustenance for a new beginning. Before we walked we heard from Commissioner Justice Murray Sinclair, Chief Bobby Joseph and his daughter Karen Joseph, as well as Dr. Bernice King, the daughter of Martin Luther King. This was pretty inspiring, to say the very least. 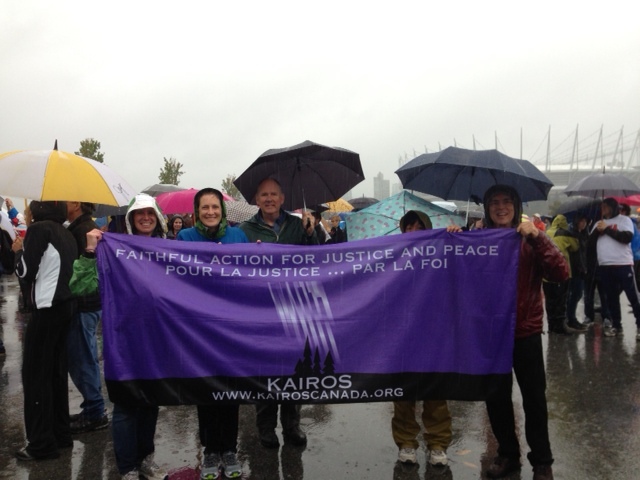 We walked beside survivors, students, families, organizations and church groups. 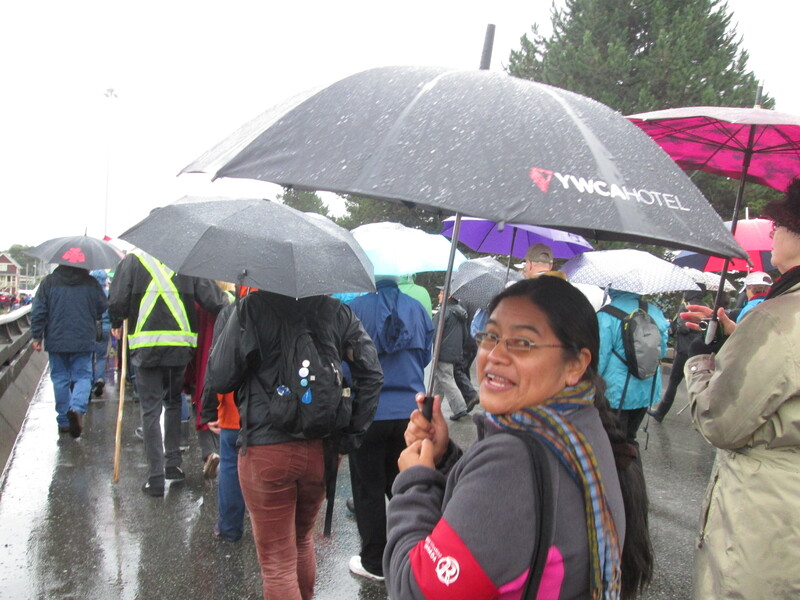 Many of the churches in Vancouver had cancelled services so that congregations could participate in the walk – a different way of being in worship. We walked beside MP Peter Julian and he and Naty chatted about her role as an Honorary Witness and the ongoing threats to Indigenous rights because of mining. 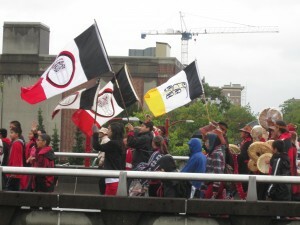 There were singing, drumming, dancing and more tears. 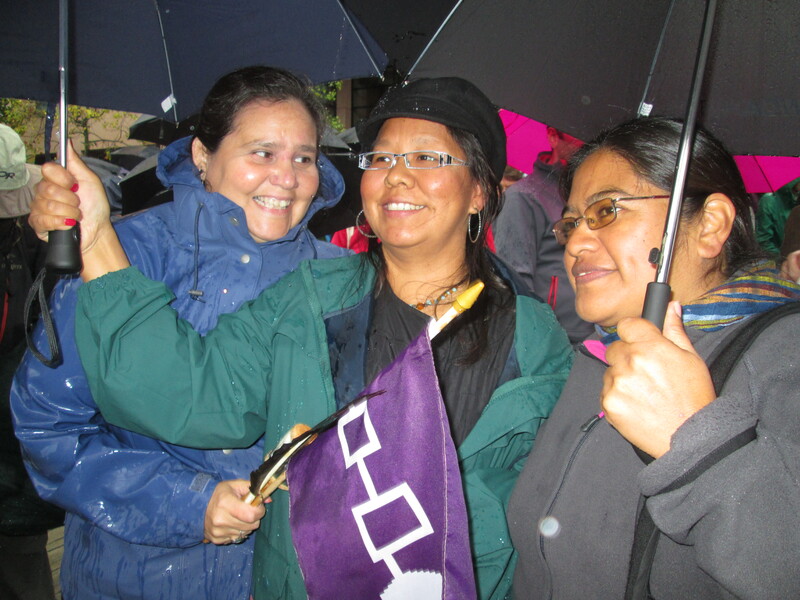 We also had the privilege of meeting former Native Women’s Association President Beverley Jacobs and a friend, and many others. We marched along the highway and at one point the road did a hairpin turn so we were marching on the opposite side toward the thousands of people who had been marching behind us. I was reminded of marches I have accompanied in Colombia which are about reclaiming space and territory – not just physical, but cultural and political space. It felt like a very visible and physical pledge to reconciliation and right relations. Now we return to Toronto for some work with Naty before she returns home. Like her, KAIROS promises to honour the survivors’ stories by bearing witness to truth and working towards reconciliation. We hope you will journey with us and let us journey with you.